Learn some tricks and tips on how to make your eForm and resultant clinical note more readable and easier to interact with. eForm formatting can be useful to make your Ocean eForms and Ocean-generated clinical notes easier for the reader to efficiently interpret. The following describes a few methods you can use to format your eForms and the generated clinical notes. In the eForm editor, you can use simple HTML tags in captions to make parts of the clinical note that is generated from your eForm either bold, underlined or italicized. This <b>word</b> will appear bold, these <i>two words</i> will appear italicized and these <u>last words</u> will appear underlined. Click "Add item", and drag the item to the top of the eForm, above all the other text. In the "Caption" field, type the title you would like to appear at the top of your clincal note with simple HTML tags. For "Type", select "Label". The <b></b> tags make the title bold. The <u></u> tags make the title underlined. The <br> tag adds a line break after the title. In the "Note Formatting" tab, find the "Create a note for this item" option and select "always" from the dropdown menu. In the "Scripting and More" tab, enter the value of "false" into the "Show this field if" input box. 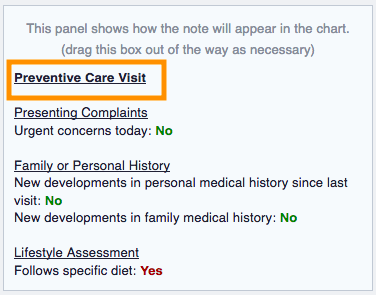 This will disable the title from being visible to the patient and only visible to the clinician reviewing the note. In order to access an item's value in the caption or custom note field you can add the special string "$$". This is particularly useful when using formula fields. If you would like to display the resulting formula so that the patient can also see it you can add a caption such as "Score: $$" to the "Caption" field. If you would like to add a custom note to an item you can also use "$$" tag in the "Custom Note" field. Add item(s) in your eForms as "Labels" for messages, such as instructions or consent information (as opposed to section captions, which are bolded automatically and can be overwhelming to read through). If you just want to insert a blank line within the clinical note, the eForm Editor has a quick and easy way to do this: simply add in a "Blank Line" item from the dropdown menu under the blue plus (+) sign (next to "Add Section"). Click on the item that you want to surround with white space. To insert a blank line before the item, copy and paste the item caption (from the General tab) into the "Custom Note" field (in the Note Formatting tab). Move your cursor to the beginning of the text in the "Custom Note" field and tap the "Enter" key on your keyboard to add a blank line before the caption text. To insert a blank line after the section, copy and paste the item caption (from the General tab) in the "Custom Note" field (in the Note Formatting tab). Move your cursor to the end of the text in the "Custom Note" field and tap the "Enter" key on your keyboard to add a blank line after the text. There are many customizable formatting options for the Ocean-generated clinical note possible. These include changing the colour, order, spacing, etc. of eForm answers in the clinical note. These changes can be configured in the Note Formatting tab of the eForm Editor. For more on this, please refer to "Note Formatting Tab" in: "Guide to the eForm Editor - Add Item".